I must reply to this private letter that was sent to me. It was written to Cage Rattler by Mr. Martin Armstrong. You are making the opposite mistake of Karl Marx. Marx assumed that everyone in the private sector was corrupt and therefore that property held in the hands of government would be fairly managed. Marx never accounted for human nature and it doesn't matter if control over money is private or public, both have historically tended to exploit it for personal gain. Money is ONLY a medium of exchange and it is NOT, and has NEVER BEEN a store of value. Gold in itself has been a store of value as demonstrated in Korea and Asia. Gold was a store of value throughout ancient times, however money NEVER was! These are two separate issues that should not be confused. To the contrary, Mr. M, these are two separate confusions that deal with the same issue! Your assumptions always conclude that the values established in a public "marketplace" represent the private views of the majority of people. In other words, if someone trades anything using the marketplace price and using the accepted mediums, the mechanics of that trade must also represent the mindset of the person. Throughout history, it rarely has. Your view is further skewed with the "control over money" issue. The world has always assumed that the "people" want someone to control the money, be it public or private. When one looks closely into the private actions and reactions of people during various civilizations, the mindset of the majority (the average citizen) was always that we don't need "money at all". Just let us alone so we can trade our things. The modern argument of the Public vs Private "control" always found the banks as representative of the term "Private" and the government put forth as "public". The "free market citizen" was never considered as a viable contender to pick the trading medium. Gold was a store of value throughout ancient times, however money NEVER was! The Greeks, Romans and everyone along the way ALWAYS and WITHOUT EXCEPTION played with the gold content of their coinage which led to Gresham's Law - good money drives out bad money. Whenever money was debased, older issues of higher metal content were hoarded. They then ceased to be MONEY (medium of exchange) and became a (STORE OF VALUE). With the clear viewpoint that I presented above, we can see that this next statement does not apply to a post contraction "free market trading arena". Rather it is the present conjecture, using the present thinking in a prosperity-mode mindset that assumes the private and public terms as the only viewpoint. They are only two parts of a three part society. If you think that a return to a gold standard in some way will eliminate these issues, you are wrong! No matter if it is the private sector or the public sector, whoever ends up in charge will always play games. Indeed, if a true free market in gold was established and all gold was coined and sold into the market place, games would still occur. However, new concepts for hard times would require mines to make all coins to conform to set standards and pay their taxes to governments with the same (however high that might be). In addition, they would pay their help and buy supplies with the same. Private stores of gold (both government and private) could choose if they wanted their bullion coined or not for a fee. Yes, the value of gold would go very high compared to real things, but it did that long ago, before banks called it a "medium". Anyone that owned gold would be rich. So what? Anyone today with a lot of cash is rich, again so what? 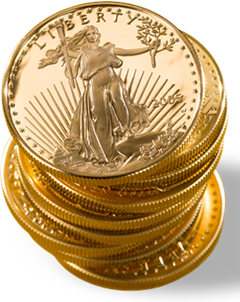 Gold money is spent and loaned and, in general, always circulated. Just as in the early days before banks when gold was just another thing of wealth, but not the only store of wealth in a person's portfolio of things. Yes, banks and governments would fail and go bankrupt as they always did. Yet, the money supply would never be changed because of their failures. People that loan gold money would learn not to count that asset loan as part of the money supply as today. Gold is a store of value today - but it is NOT money. It is NOT acceptable to pay your VISA, rent or to buy food unless on a barter basis. Only dollars ( money ) is acceptable in the US, and now Russia while it may be yen, marks francs, deniers or whatever in other nations. Again, you assume that gold is not money because it is not accepted as "the medium" in the Government / Bank operating economic system. I submit that this perception represents a short conclusion. If we extend the thought we find that no government or bank said that gold was not money. They only decided to not "use" gold as "legal tender money". Both of these entities chose to pursue this route because they wanted to create more "money" than was in existence. Something they could not accomplish using a money that possessed a "store of value". As I pointed out, the "citizen" and their trading are the "private free market" that the world economy is and has always been based on. This market place does not need "more created money" as it worked fine using the old "store of value gold" as long as the market could increase or decrease its purchasing power as measured against all goods and services. Banks and governments fought hard to stop this function because it took power away from them and returned it to the economy. I simply disagree with your interpretation of 1929, the Fed and the wildcat banking era. Your view of anti-central bank was shared by Andrew Jackson who was bitter because he had lost money and was turned down for loan in his youth. When he became President, he destroyed the Bank of the United States and with no central control, the entire banking system quickly fell into trouble. There are countless "broken bank" notes that collectors can buy today from every little one-horse town in the country. Some were in the hands of local politicians who quickly exploited the system and bankrupted their communities. The Constitution specifically prohibited the States from issuing money and because of the hyperinflation of the 1700's. You are also misinterpreting dictating private investments with restrictions of asset class and leverage. You now have a perfect example of your no interference policy for the private sector. Long Term Capital has just blown up by leveraging positions to the extent of $1 trillion. The uncontrolled activity of this one hedge fund is going to disrupt the free markets everywhere in ways you have not yet even noticed. There needs to be a rule of law that establishes the basic guide lines. It should NOT expand into regulation of every aspect over investment. What an individual does with his own money is his own business. However, when institutional money is gathered and used at the discretion of fund managers who buy into the latest hype like Russia, then allowing this type of investment to be carried out with ANY restrictions whatsoever, is extremely dangerous. LTCM is a significant threat to both bonds and stocks right now. A few other funds are now rumored to be in a similar position. Such unbridled leverage threatens to bring down a lot more than anyone suspects. I think there will be investigations and a whole new set of regulations that will come out of this debacle. The Fed is currently calling around the street in an attempt to assess the damage. There will come a day when you will see that the proposal of that I have made to merely regulate asset class will be far more attractive after the next set of regulations come storming out from all government bodies that will seek to restrict every aspect of investment. What they don't understand - they ultimately kill. Your argument for no regulation will not even be seriously considered by any government body I have ever testified before. In reality, there may be no way out, because the people themselves will demand action because they have lost money in stocks caused by hedge funds in Russia and interest rates like LTCM. They will in the end bare the blame and a host of new regulations will spring forth in an effort to appease the people who demand government action. Sir, I have commented on your thoughts because it is important to present the flaw in this perception. Some of your analysis is in the context of a rebuilding of the government/banking financial system after a great contraction. It places little support to gold as a choice to preserve wealth during this event as gold will not be in demand. I submit that you have misread the historical attraction to gold that private citizens impart upon this metal. The human factor always has and always will gravitate to using things as trading items. We were born a people of earth with senses that touch, see and feel for value. Whether our trading things can be considered money, a medium of exchange, legal tender or a store of value, was never the issue. Governments and banks made them an issue so as to circumvent our value of trade for their benefit. As such, when the next downturn threatens to destroy the perceived values created in fiat currencies and securities, people will then circumvent these modern concepts and return to trading the most convenient things. History, not modern computer research, has shown that we will return to gold. Trichet :...of how little CBs know...!? Quizzed at his last press conference, Mr Trichet insisted that he did not wish to be “the prisoner of methodologies” but accepted “that the potential growth of all economies of the industrial world is probably now significantly lower than the previous estimate”. He added: “This is one of the areas in which we have to work very hard from a research and methodology standpoint,” which was either a sign of refreshing intellectual honesty or possibly a worrying indication of how little central bankers know. >>> Honest CBs must repeatedly admit that they don't (can't ever) know the homo economicus under all circumstances. I conclude with " interesting times ",...actually meaning, dangerous times !? >>> Stiglitz :....a good store of value...!? And in relation with China ...orderly discussions...!? In a multipolar world with a representative basket of currencies functioning as reserve,...the element of -value storage- MUST be included/incorporated !!! Every authority can publicly remain silent on gold for as long as they want,...but the longer they remain gold-silent the more important gold's role will become. A crescendo dangerous world needs that reliable-waterproof STORE OF WEALTH now more than ever before. So "they" better hurry to fix this or the people will take refuge to the gold store of value-wealth...regardless of further gold governance. The new IMFS that will rise out of the ashes after the collapse, will have to incorporate gold as value/wealth store as for the "making money" FI to survive ! "Making money", without the possibility to store the earned (unearned) wealth in a universal tangible (freegold) that protects the wealth PP for 100%,...is doomed to fail (is failing now). And this is exactly what all wealth-owners on the globe are increasingly understanding-experiencing. Freegold is also a "political statement" ! That's why nobody dares to touch it in an official-public way,...for the time being of course. The August Hat Trick Letter report on gold & currency is to be posted this weekend. It contains some very surprising information on the cash intermediary currency market. A deep USDollar devaluation comes!!! Posted by Gwen Robinson on Aug 21 09:58. The new International Financial and Monetary System (IFMS) that will rise out of the ashes after the collapse, will have to incorporate gold as value/wealth store as for the "making money" Financial Industry to survive ! If you post your question on the latest thread, I'm sure Belgian will answer it. I don't think he will see it here though. You might address it to Belgian or B. to be sure he recognized it is to him.